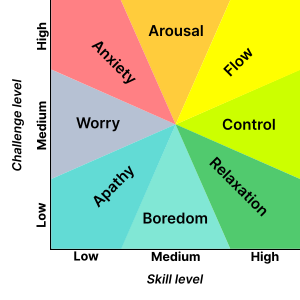 First identified by Mihaly Csikszentmihalyi, flow is a kind of mental state where you perform an activity while being fully immersed and focused on it. In this Ted talk, Mihaly describes flow as the point where high skill is matched by just-the-right challenge. Interestingly, video games are known to get people into a state of flow. So does sports, music and a variety of others. Flow makes us feel good. As human beings, once we experience flow, we tend to look for as much of it as we can find. That’s why video games tend to be addictive. Flow in a Chess game is quite common too, as reported by many people. As a chess parent guiding your child in the early stage of their chess exploration, it’s important to let them experience and enjoy flow, by making sure they play at a level that is “just right” for them. In today’s competitive chess environment, you might think that “play-up” will give your child a faster track to higher rating, and it might; but consider also that the child might lose interest in the game altogether. And if you want some happiness too, I recommend putting yourself in their shoes.